Apple – Pay Your Bloody Tax!! There’s nothing more infuriating in the days of austerity to find out that someone isn’t paying their tax bill – and consequently, the tax bills for people that already pay them, like us, rise and continue to rise to make up the shortfall. David Cameron, our dearly beloved former Prime Minister, once said “those with the broadest shoulders should carry more of the burden”. He was alluding to the fact that the United Kingdom should embrace a more progressive tax system – it hasn’t quite happened yet… but I’m sure it’s on somebodies to-do list (please, stop laughing!). Turns out, among the many companies that are alleged to be participating in tax jiggery-pokery, Apple have gone for the top prize. Apple’s UK and European operations are HQ’d in the Republic of Ireland. Well, how much has been ‘avoided’ (we’re being kind here, whilst not technically evasion – most people will be forgiven for feeling that this is tax evasion, even if not specifically – the ‘correct’ term in this case is ‘cosy tax deals with the authorities’), we’ve got an idea – but ultimately it’s up to the Irish tax authorities to decide. We’re looking at a minimum of £11 billion – that’s right – £11, 000, 000, 000 in unpaid tax. This is an estimate provided by the European Union. Some analysts and accountants have said that the true figure, according to their calculations could be £20 billion – that’s right – £20, 000, 000, 000. Enough for a decent holiday, right? Apple seems to have managed to negotiate some kind of marginal tax rate. I’ll admit, that most people would like to have a personal tax rate this low, but unfortunately it’s just not sustainable even if you want to have the most basic of societies. Now a 0.005% corporation tax rate isn’t illegal. However, charging other businesses (including competitors) 12.5% whilst charging another company 0.005% under some kind of special agreement is illegal. It’s firmly against the rules set out by the European Union – of which the Republic of Ireland is a full member of. The EU classes this as unlawful ‘state aid’ – i.e. giving some companies a leg up whilst taxing others the full amount. What makes this even more outrageous is the fact that the corporation tax rate in Ireland is already rock bottom compared to most developed economies, standing at just 12.5%. To put this in context the UK’s corporation tax rate has been lowered in numerous years following the Global Financial Crisis however this still stands at 20%. Turns out, 12.5% was just way too much for Apple. In fact, in their eyes, it appears 1.25% was way too much too. That’s right, Apple is the largest corporate entity on Earth – which isn’t surprising. Have you seen how much iPhones and Macs cost these days!? There profits year on year are usually above $50 billion. Chill out, Apple is going nowhere. It’s a license to print money. If Apple collapses, so does capitalism ;-). But seriously, there’s no need to worry. Apple currently have approximately $200 billion rolling around in a bank account – even having to pay a much larger bill on $50 billion, they’ve still got reserves many millions/billions of times bigger than most companies on the planet. To be fair – this isn’t Apple getting fined. They wouldn’t have a current account balance of $200 billion had they actually paid their bloody taxes! So don’t feel sorry for them – they’ll be fine. Obviously, Apple are appealing the decision and the United States Government, including the Treasury, are sticking their oar in. But, guess what, Ireland are appealing as well. Cue shocked faces. Why is Ireland appealing this landmark tax ruling? I guess they don’t want to annoy Apple. However, maybe the Irish government should consider how annoyed Irish tax payers are/will be that they are paying more tax because multi-national corporations based in their country are paying next to no tax? It’s no secret that Ireland, along with every other developed nation in the world, is still proceeding through a Global Financial Crisis that has brought financial services and governments to their knees. Ireland know this – after all they needed bailing out by the United Kingdom, the European Union and the International Monetary Fund. Now the EU are handing them (essentially) a cheque with their name on it for a minimum of €13 billion. 13 billion euros – that’ll probably come in handy to pay down some of the estimated €206 billion national debt that Ireland has – which is currently running at 103.38% of GDP. Maybe, however, they’re just playing a game. “Oh no, course we don’t want it. GIMMIE THE CHEQUE!!”. Undoubtedly, any government in this day and age that declines (genuinely!) free money is clearly off it’s rocker. Apple – Pay Your Bloody Tax Bill! Apple charge us lots for shiny things. We pay. They make lots of money and are happy. Just as with everyone who makes money, you have to pay the rate of tax proportionate to your income. That’s the way this thing works. That way, we’re not expecting those on National Minimum Wage to pay a nominal tax rate of 97.8% and make a solitary tin of bins last the whole month ;-). There’s really no excuse for a company earning mega profits not to be paying their fair share of very low rate taxes – namely 12.5%. Apple would probably be best to cough up and get this out of media spotlight ASAP. It’s really not worth it to any company to have to cope with years of legal wrangling with the ECJ when you know you are morally in the wrong. Expect Apple popularity to drop somewhat and some people to boycott them if they keep up the whole ‘I only want to pay 0.00000000000000000000000000000000000000000000000000000000000000000000000000000000000001% tax routine’. The unmasking of a National Security Agency intelligence program, which allegedly collects and analyses data from some of the worlds biggest companies has come as a shock to some and no surprise to others. Leaked slides from a former CIA employee appear to show reasoning for their access to several high profile companies servers and leave the reader in no doubt to the ease of access they allegedly have. The companies implicated in the leak include Microsoft, Yahoo, Facebook, Google, Apple, Dropbox PalTalk and AOL. Naturally, the companies have released statements regarding the issue. After all, to not do so could a) imply truth in the claims and/or b) be corporate suicide. Lets take a look at what they’ve said. Included in the leak were also mentions of YouTube and Skype. For sure? Well we can’t tell. However, intelligent speculation would dictate that there is no smoke without fire. The problem for the general public is that, it isn’t in any of the parties interests to be fully frank about the situation. On the side of the US government and intelligence agencies including GCHQ admitting to this kind of indiscriminate mass collection and studying of data, no matter how noble or well meant the intentions are, would be damaging to public confidence in the US administration. Equally, in the UK, rising public concern and tension is building up despite there only being claims that the UK had access to the US PRISM intelligence program, not that the UK government or intelligence services were directly collecting this themselves. In addition, it would be highly damaging to any potential (or possibly continuing) support by companies of the PRISM program if there was a confirmation on behalf of the government or the security services. Equally, for the companies – admitting this kind of definitely questionable, potentially (legally) murky situation would likely be corporate suicide. The strong denials from all of the companies allegedly involved with the PRISM program come as no surprise. You could expect mass panic and potentially mass boycotting of services provided by a company which was allowing unrestricted and unmonitored access to all their servers data. If a mass panic develops after such an admission, investors could lose confidence in the companies and pull all their funding and advertisers may also flee if the user base of servers dwindles and to avoid negative press by association. Despite all of the companies shown in the leaked slides being multi billion pound companies, the scale of damage that could be done if there are truth in these allegations could be far reaching, long lasting and ultimately inflicting a indeterminate amount of damage. We’ve got a short and simple tutorial here for troubleshooting problems relating to the auto start on boot of gfxCardStatus. Some of the Mac users among our readers and members may be using the software as part of our solution to the Mac OS X BSOD ‘superbug’. 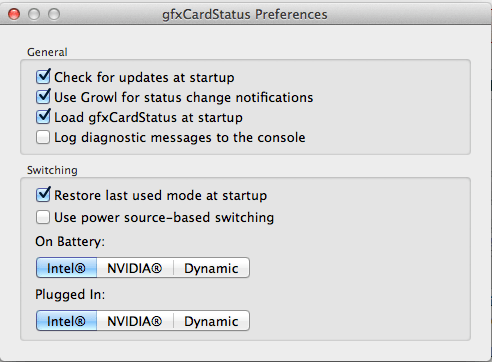 This tutorial is for you if you have selected the option in gfxCardStatus preferences to ‘Load gfxCardStatus at startup’ option but gfxCardStatus still doesn’t start when you startup / boot your computer. 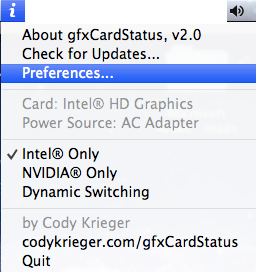 Now, sometimes users might experience that gfxCardStatus does not automatically start when booted, despite this option being selected. When gfxCardStatus is initially downloaded, it isn’t an application that has to be ‘installed’ as such – there is no installer. The application file itself is (usually) downloaded straight to the ‘Downloads’ folder. Usually, for applications such as this, users will attempt to run the application from the ‘Downloads’ folder, see if it is for them, and then if they decide to keep it, close it and move it to the ‘Applications’ directory. However, we received information from the developer, Cody Krieger, that failing to load on boot (despite the option being selected) could be caused by the ‘Load gfxCardStatus at startup’ option being checked while in one location (for example ‘Downloads’) and then the application being moved to another location (such as ‘Applications’). So, how do we fix this? Well, it’s very simple. If you have (or might have) moved the location of the gfxCardStatus since the ‘Load gfxCardStatus at startup’ option was selected, simply go back into the preferences of gfxCardStatus, uncheck the ‘Load gfxCardStatus at startup’ option and recheck it again. This should solve your problems. During our discussions with gfxCardStatus developer Cody Krieger, we also got some information which will come as great news to users affected by the OS X BSOD ‘superbug’ problem in that the next release of gfxCardStatus, v2.3 should work correctly for solving this issue. Regular readers will remember that, currently, using versions above v2 of gfxCardStatus only works once for the OS X BSOD ‘superbug’ problem. Will Mountain Lion be the OS X BSOD Superbug Solution? Apple have today released the latest version of their OS X operating system – Mountain Lion. Of course, this is usually an exciting time for Mac owners as they browse the new features and improvements and work out just how fast they are going to buy the latest operating system. However, there is a much more critical reason for a possible OS update for Mac users, especially ones suffering with the OS X BSOD superbug problem. Although DPS Computing managed to discover a temporary solution (which, by the way, still works :)), Mac users (including ourselves) are eager for a permanent solution that doesn’t mean that we have to effectively disable one of our graphics cards just to stop our Macs freezing every 5-10 minutes. Has this been fixed in Mountain Lion? – well as yet, we’ve not been able to verify this – we would be particularly eager to hear from anyone (via e-mail, website contact form or a comment on this post) if they have previously suffered from the OS X BSOD superbug problem and have upgraded to Mountain Lion and it has fixed it. However, this raises further questions. If this problem with the nVidia graphics card drivers has been fixed in Mountain Lion, why has a free update not been given to Lion users? After all, it would be unacceptable to effectively charge for what amounts to a critical bug fix, having already paid thousands of pounds for Apple Mac equipment. Another question is, if this problem with the nVidia graphics card drivers hasn’t been fixed in Mountain Lion, why not? The issue was first reported on Apple’s community support forums approximately 18 months ago, with Apple acknowledging the issue 12 months ago. Some would argue that the time spent on ‘fixing’ the problem has already been too long, but if there is no fix, free or otherwise, available still, where does that leave Mac users (especially mid 2010 model users) suffering from this catastrophic bug within the nVidia drivers shipped with Lion? Also, if no fix is released, does this mean that mid-2010 models of Mac computers are incompatible with OS X Lion, despite being previously confirmed as compatible? There are still many questions to be asked, and more importantly, answers to be given regarding this problem, which many Mac users will now hope, having coped with the issue for at least 18 months, is close to a resolution to allow them to fully utilise their Mac hardware. Back in the 90’s with Windows, it wasn’t particularly easy to install new fonts. 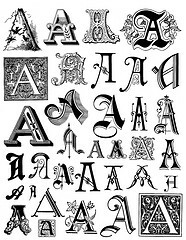 There were many different types of fonts for many different machines and the only way to really test whether it would work on your computer or with your version of Windows was to download them, follow the instructions, cross your fingers and try them out. There was also the issues of fonts looking different on different computers, not being available on other computers and not many quality fonts around. Now, in 2012, many of these problems have gone away. You’ll recall that previously downloading fonts involved a lot of dragging and dropping and customising settings. That’s before even considering the problems surrounding getting the fonts to work in the necessary programs. Well, Mac OS X makes this really easy for us. Fonts are most definitely now plug and play. Don’t go searching for over complicated ways of installing them, just follow these simple instructions and your new fonts should be working perfectly. 2. Download the font. This is exactly the same as downloading any other file, no special actions required here. Simply click on the download like at it should start making its way to your ‘Download’ folder. 3. When the download has finished, proceed to your ‘Download’ folder. The font you’ve downloaded is likely to have been zipped (or otherwise compressed) so you’ll need to unzip it (there’s many free utilities for this on CNET’s Download website if you don’t already have one). 4. There should be a .ttf (or similar font file) contained in the unzipped folder. Double click on that. 5. The Font Book application will open up and allow you to preview the font. 6. If you wish to install it after previewing it, click on the ‘Install’ button in the bottom right hand corner. And there you go – font installed! Your new font should now be available for use in all of your applications. Now that’s much easier than it used to be isn’t it?